I’ll be the first to say that the accountable care organization (ACO) construct has been more successful than I thought it would be. This provision in the Patient Protection and Affordable Care Act (PPACA) has resulted in the formation of over 800 public and private ACOs in all 50 states, the District of Columbia and Puerto Rico, including 436 Medicare ACOs, 316 commercial ACOs, and 62 Medicaid ACOs. Almost 20% of the insured population (~30 million people) receive their health services through ACOs, including 2.4 million in Medicare ACOs, 15 million non-Medicare consumers in Medicare ACOs, and 14 million consumers in non-Medicare ACOs (see Accountable Care Organizations In The U.S.: A Market Intelligence Briefing). Currently, two-thirds of Americans live in a geographic area with ACO coverage. That’s a big change in just five years. In addition to the enrollment exceeding my expectations, I have also been surprised at the rate of adoption of ACOs by commercial health plans. While there has been some ACO adoption by state Medicaid plans (see Why Medicaid ACO Models Seem Confusing and Understanding The Two Medicaid ACO Models), every month there seems to be a health plan announcing an ACO partnership. Just in the last few months, we’ve covered: Aetna & Mount Sinai Health Partners Form ACO, Health Net & John Muir Health Form New Accountable Care Organization, and Humana & Northwest Physicians Network Form ACO Partnership To Improve Care For Washington Seniors. But we’re still in the early stages of knowing what ACOs will finally look like in the delivery system. Right now, “if you’ve seen one ACO, you’ve seen one ACO.” There is lots of variation in models. What the ACOs share is a common framework for “pay-for-value” reimbursement to organized groups of provider organizations. ACOs are expected not only to deliver clinical services, but also to be responsible in some fashion for their costs. But there are a wide range of ACO reimbursement models with a varying amount of financial risk – from shared savings to full risk (see What Are The Different Medicaid Performance & Reimbursement Models For ACOs? : An OPEN MINDS Market Intelligence Report). Independent Physician Group – Independent Physician Group ACOs are those that have a single physician group owner and do not contract with other providers for additional services. These ACOs are typically smaller primary care physician groups and are frequently only involved in one accountable care payment arrangement. Physician Group Alliance – Physician Group Alliance ACOs are similar to Independent Physician Group ACOs, but include multiple participating groups. The partners involved in these ACOs are often multi-specialty physician groups, though they still lack affiliation with hospitals. Expanded Physician Group – Expanded Physician Group ACOs only offer outpatient services directly, but they do contract with other providers to offer hospital or advanced care services. This type of ACO can potentially have any number of owners. Independent Hospital – The defining characteristic of Independent Hospital ACOs is that they have a single owner that directly offers inpatient services. Outpatient services can be provided directly by the ACO if the owner is an integrated health system or a physician-hospital organization, or they can come from a contracted provider. Hospital Alliance – Hospital Alliance ACOs are those that have multiple owners with at least one owner directly providing inpatient services. Outpatient services can be provided either directly or by a contracted provider. These ACOs may also contract with providers to offer advanced care services. Full Spectrum Integrated – These ACOs directly provide all aspects of health care to their patients, and either act as the dominant or sole entity in the arrangement. A recent report from The Commonwealth Fund (see Hospitals Participating In Accountable Care Organizations Tend To Be Large And Urban, Allowing Access To Capital And Data) found that while more than half of ACOs include a hospital, only 20% of all hospitals belong to an ACO, and only 10% participate in one of Medicare’s ACO programs. And, 85% of hospitals that participate in ACOs are short-term acute care facilities. I was surprised at the small percentage of hospitals participating in ACO initiatives. As the ACO model gains more market share, this could spell strategic difficulty for the large group of hospitals not participating. But more hospitals are entering the ACO market, with half of those not already in an ACO expecting to be part of an ACO launch in the next twelve months (see The ACO Trends for Hospitals & Health Systems: 9 Metrics to Know). …hospitals may improve integration and coordination efficiencies between primary providers and specialists, and between hospital care and post-acute care….hospitals have more access to capital, which facilitates data collection and infrastructure…. [and] hospitals are large, heavily managed organizations which may help them develop programs to succeed in the new model…. [But] Reducing hospitalization allows the hospital to eliminate variable costs, but does not address the fixed costs of hospitalization. Thus, only the variable portion of the cost of hospitalization is returned to the organization. In a non-hospital-based ACO, on the other hand, a reduction in hospitalization saves the ACO the entire price of that hospitalization, which is much more lucrative. For specialists and specialty provider organizations, finding the opportunities in the emerging ACO landscape is tricky. In our survey of mhca members on behalf of the mhca Innovation Incubator (for more information on their next program, see Sustainable Primary Care/Behavioral Health Integrated Service Models The Focus Of May mhca National Innovation Incubator) the top three challenges voiced by behavioral health provider organization executives in developing sustainable collaborative relationships with ACOs were that ACOs: lack an understanding of behavioral health and the types treatment; don’t know how to use behavioral health providers to assist with individuals with chronic conditions; and don’t have large enough risk-based contracts yet to enter into value-based contractual arrangements for behavioral health services. But despite the challenges, specialist provider organizations are going to have to find a model to work with ACOs or risk losing a substantial eligible consumer base. We’ve provided some insights on this issue in previous coverage – TACOs, Anyone?, Finding The Opportunities For Behavioral Health In ACOs, and Lessons From An Early Adopter ACO. 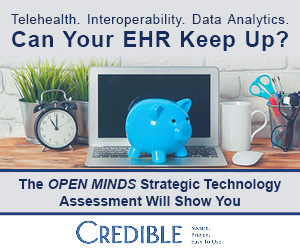 For even more, be sure to join me on June 9 at The 2016 OPEN MINDS Strategy & Innovation Institute for the plenary session – “Taking Risks, Finding Rewards: The Ochsner Accountable Care Organization Strategy” – by Philip Oravetz, M.D., Medical Director, Accountable Care, for the Ochsner Health System. My recent conversation with Dr. Oravetz included a discussion of their plans for enhanced community collaborations – a key issue for specialists of all types.